Be the first to share your favorite memory, photo or story of Annual . This memorial page is dedicated for family, friends and future generations to celebrate the life of their loved one. 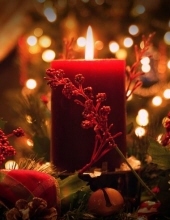 Carter-Conley Funeral Home cordially invites the families we have served, as well as the general public, to celebrate the Christmas Holidays with a time of remembrance during our Annual Candlelight Remembrance Service. This service is held on the first Sunday in December, every year. It is our hope to make the holiday a little easier to bear as we remember the reason for the season, as well as our loved ones. To send flowers or a remembrance gift to the family of Annual Candlelight Remembrance, please visit our Tribute Store. "Email Address" would like to share the life celebration of Annual Candlelight Remembrance. Click on the "link" to go to share a favorite memory or leave a condolence message for the family.